Hollywood heartthrob Johnny Depp is a regular visitor to Japan, and is due to return again later this month, but he hasn’t shown his face so often in Australia. 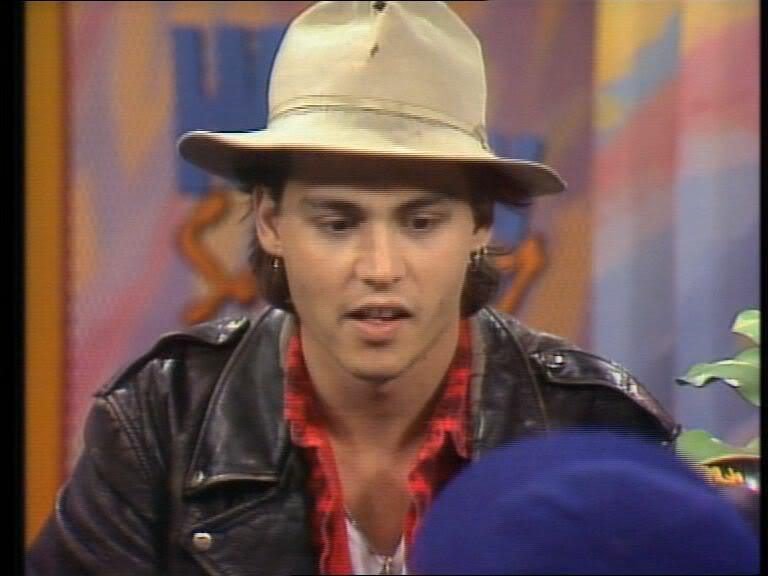 His first visit Down Under was way back in 1988, when he made a whirlwind trip to promote 21 Jump Street, the show he was then appearing in. 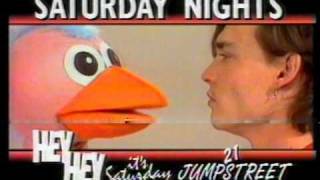 Depp appeared on the Red Faces segment of Hey, Hey It’s Saturday, then Australia’s most popular program. He appeared on the program with Dannii Minogue, then perhaps better known in Australia than her soon to be globally famous singing older sister, Kylie. The show aired on June 25, 1988, and he did not return to Australia after this show until 2010, when he showed up to promote Alice in Wonderland. He also appeared in an ad for the show together with Ossie Ostrich, the risque puppet that co-hosted the program with Darryl Somers, while Red Symons was also a regular. Just as the Beatles created an iconic scene with their 1966 arrival in Tokyo wearing traditional Japanese happi coats, so too did the Fab Four make waves when they toured Australia two years earlier at the height of Beatlemania and establishing a quirky relationship with Down Under at the same time. 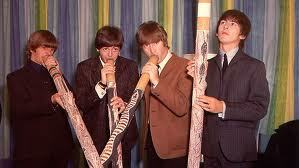 Australia’s archetypical Beatles image features the Fab Four standing around while holding didjeridoos, an indigenous Australian instrument that Ringo Starr on the far left of the picture appears to be tackling with greater fervour than bandmates Paul McCartney, John Lennon and George Harrison. It’s a great pic, but the only problem is that Ringo’s involvement in the Beatles’ June 1964 antipodean jaunt had been curtailed by illness and his place at the drums was taken by a ring-in called Jimmie Nicol, whose 11-day stint with the band appears to have created lifelong upheaval. Ringo fell ill on June 3, 1964, just days before the Beatles were due to play concerts in Australia as part of the band’s first world tour. Nicol was quickly roped in to take over and played eight gigs in Ringo’s place until the mop-topped regular could return. His figurative 15-minute stay finished, Nicol returned to obscurity, but not before taking part in the only five-member Beatles news conference ever given, which took place in Melbourne on June 14, 1964, upon Ringo Starr’s recovery and arrival in Oz. 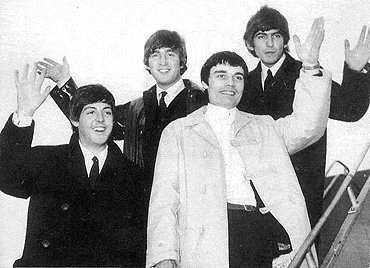 The Beatles with Jimmie Nicol (center) arrive in Sydney in June 1964. Nicol’s presence was a quirk of fate that started a somewhat left-field relationship with Australia, which surprisingly made the land Down Under an anime superpower then surpassing Japan despite Osamu Tezuka having made inroads into the world’s important markets with his cartoons. And this could be attributed to the Beatles. 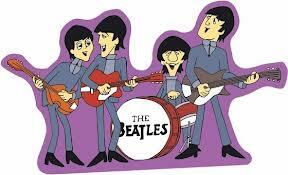 Almost unknown in Japan despite running here possibly from as early as 1968, The Beatles cartoon series ran from 1965 to 1969 and was an enormous ratings hit in every country in which it showed. And nearly all of the 39 episodes in the series were produced in Sydney’s Artransa Studios, momentarily making Australian animation production a global leader. Despite the enormous success of the Beatles’ 1964 tour of Australia, the band never played there again despite coming close in the 1966 ill-fated Far East tour fondly remembered in Japan for the happi coats, but also the scene of right-wing fanaticism that was ultimately instrumental in the Beatles deciding later that year to give up touring for good. 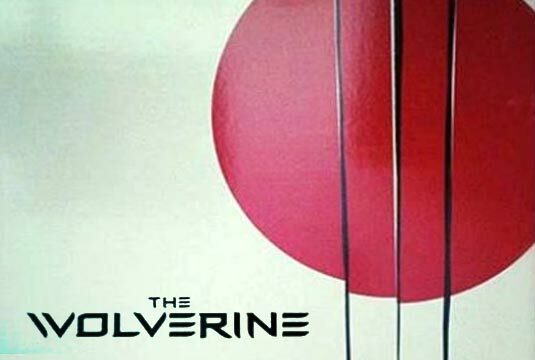 The Wolverine, a movie with strong Australia-Japan connections with Hugh Jackman as its star and much of the action taking place in Japan, is being plagued by people stealing its Japanese-influence sumi-e posters, according to the Melbourne Age on April 23. In a phenomenon similar to that seen in Japan about 20 years ago when women were stealing posters featuring SMAP performer Takuya Kimura‘s posters from public areas, distributor 20th Century Fox faces the mixed pleasure of seeing proof of the upcoming movie’s popularity in the theft of the materials used to promote it, probably because of the popularity of its heartthrob star, Hugh Jackman, in addition to the Japanese flavor of the flyers. 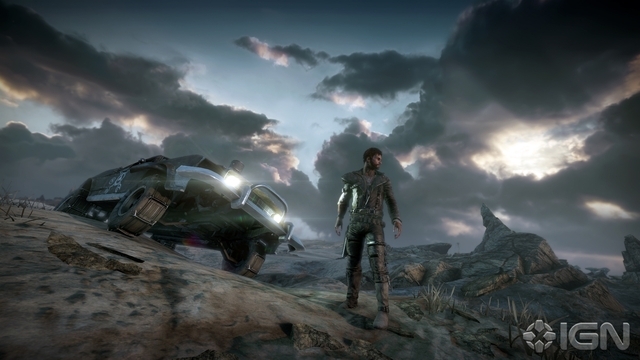 The Wolverine is the latest installment in the X-Men series of movies based on the popular comics. 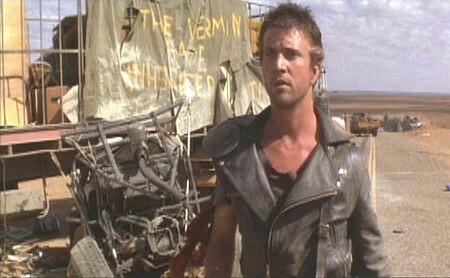 It opens in Australia in July and in Japan two months later. 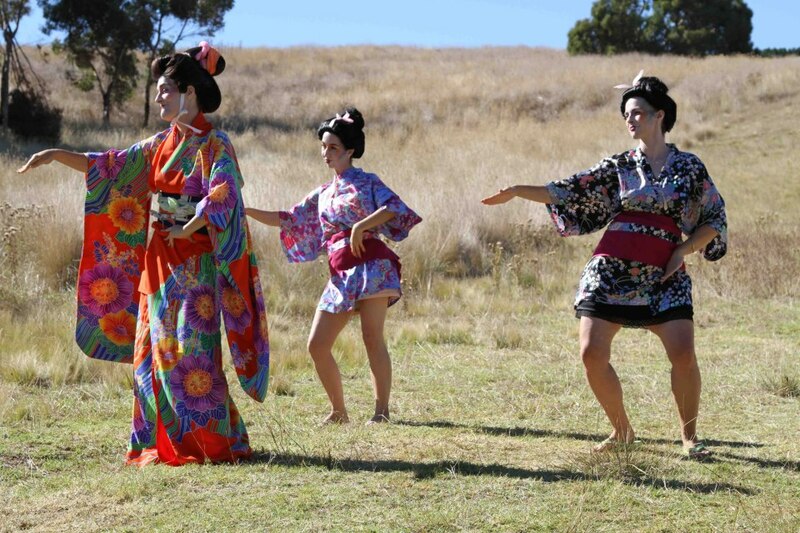 It has strong appeal for both Australia and Japan, with its Aussie star Jackman supported by Japanese actors of the ilk of Hiroyuki Sanada, Tao Okamoto and Rila Fukushima, while the movie is set mostly in Japan and much of the filming occurred in Australia and Japan. 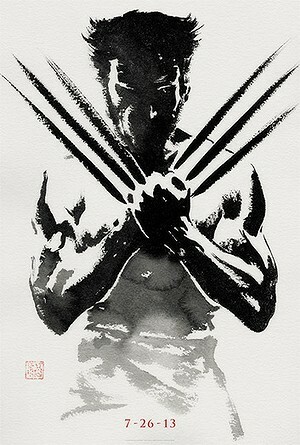 The Japan angle is apparently being plugged strongly in promotion of the movie outside of the land where it’s set, which led to the sumi-e poster, which features Jackman depicted as his Wolverine character. 20th Century Fox officials have apparently had to replace about half of the posters on bus stops around the United States as fans pocket them. Footage of an Aussie bloke returning a beached great white shark to ocean waters off the coast of Western Australia has become a recent hit on YouTube. My Goodness, Guinness…It’s a Kangaroo! Copyright © 2019 考えRoo. All Rights Reserved.